You never need a reason to want to get gorgeous and look prettier than you've ever been. Every hardworking Cosmo chick deserves a little pampering every now and then, and what better way to spoil yourself than with a good salon day? If you think a makeover is in order but you don't want any drastic changes to your 'do (just more sheen here, color touchups there, and a trim here), you can visit a salon such as Azta Urban Salon, which is conveniently located in great spots across the metro, with branches in Eastwood City, Alabang Town Center, Robinsons Metro East, The Metrowalk, and along Katipunan Avenue. Cosmo checked out the branch in Katipunan, which is just across Ateneo de Manila University and Miriam College. I've always been a little more adventurous with my hairstyle than a lot of people I know. I have, however, always been scared to have any kind of coloring or treatment done. My hair is both thin and fine, which means that it's easily damaged and difficult to style. Certain treatments, like rebonding or relaxing, are out of the question for people with hair like mine—they'll strip the hair of whatever shape and volume it has. I was always envious of how sleek and glossy rebonded hair looked, though. That was why the stylists at Azta suggested that I try their new Color Reborn treatment (P1,600 for long hair like mine), which uses Davines' Alchemic System to enhance the color and shine in your hair. My hair was still virgin black, so they chose Silver (other colors you can choose from are Chocolate, Red, Copper, Golden, and Tobacco) to give my jet black locks some much needed extra luster. After the treatment, I was really happy to discover that, while the treatment softened my hair and gave it a coat of color, it didn't sacrifice any of its natural curl or volume. My hair, which was never shiny, looked glossier than it had ever been. It also appeared to be an even darker shade of black than it was before, which I found pretty incredible. It's been over a week since the treatment and my hair is still glossy, especially in the light. Before they start your cut or color treatments, Azta Urban Salon shampoos your hair while you're in your seat! 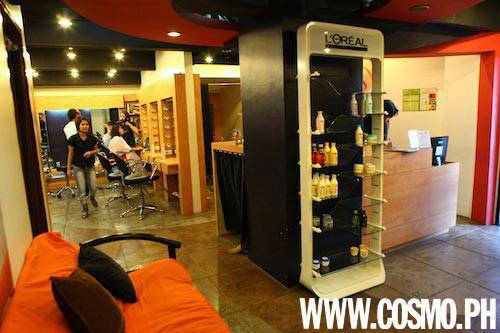 I had my first experience of dry shampoo at Azta, with my stylist washing my hair as I sat in front of the mirror, reading the January 2010 issue of Cosmo. I still had to walk to the usual salon sink to wash the soap suds off, but getting lathered up in my chair was very interesting. Since I started getting my hair colored three years ago, I found that I couldn't bring myself to stop having my locks color-treated, since the sight of roots showing is definitely not pretty or neat. No matter how put together tresses are, exposed roots give the impression of ill-maintained hair. But I haven't even gotten to my hair's dry ends. Years of consistent hair coloring and rebonding (I find that I simply love to keep my naturally wavy hair straight and sleek instead) has taken a toll on my hair strands, which have visibly brittle ends that I regularly have to trim. So when I went to Azta Urban Salon, I specifically asked for three things for my 2010 hair makeover: Color change (P1650, if you’ll only retouch the roots), Protein Treatment (P500 for long hair like mine, to bring back the healthy looking shine to my color-treated, rebonded locks), and a stylish trim (P200, to remove my hair's unsightly dry ends). After a relaxing Azta signature 'dry' shampoo session, the stylist helped me pick the shade of brown for my roots which matches that of the rest of my tresses. The process took about an hour, after which they applied protein treatment, to ensure my locks look healthy and shiny, even after going through yet another color treatment. The result? My hair looked glossy, and its color looked naturally vibrant, which, I noticed, was particularly photogenic, after seeing candid shots of my hair two days after the treatment—yes, even after I've shampooed! I also liked my freshly trimmed strands, which remained at pretty much the length I want to keep it, but this time without the ugly dry ends. My bangs were also given a touchup, which in turn gave me a youthful look. Like Regina, I was given a slip of paper, very similar to a doctor's prescription, suggesting ways to maintain my hair. It indicated that I must try using L'Oreal's Vitamino Color Shampoo and Conditioner daily to keep the color from fading; that I must apply hair masque (used like a conditioner) at least thrice a week, if I can’t go for monthly hair treatments, to keep it soft, smooth, and shiny; and that I should let my stylist trim dry ends every couple of months. See Azta Urban Salon's full range of hair treatments and services on the next page.